Join in a city-wide commemoration of the 30th anniversary of the fall of the Berlin Wall and delve into this city’s dynamic history, music, and culture. This trip was my retirement present to myself. It exceeded my expectations! It was great that travel details were well-handled, allowing me to focus on the country. I met extraordinary people, was inspired by the sights, and delighted in all I learned. Now, that's the way to kick-start a new life adventure! Join us in Berlin in 2019 for a city-wide celebration of the 30th anniversary of the fall of the Berlin Wall. You’ll experience this European cultural capital fully transformed since reunification. Masterful contemporary architecture and a strong new visual identity are balanced with carefully preserved art treasures and the best of its cultural legacy, along with iconic sites that reflect its turbulent history. Stay at the Hilton Berlin, ideally located in the Mitte district in the city center on Berlin’s most beautiful square. Political Berlin: Take a city tour featuring many of Berlin’s historic sites and visit the last standing section of the Berlin Wall. Delve into the history of Germany’s Jewish community at the Jewish Museum Berlin, which displays religious and everyday objects, photos, letters, and interactive displays. In the Schoenberg neighborhood, see a poignant exhibit about the Jewish residents who lost their lives during the Holocaust, plus the site where President Kennedy made his famous 1963 speech. You’ll also tour the Reichstag, fully restored after reunification and now a symbol of the city’s rebirth and the meeting place for the German parliament. View other works of old and new architecture as you cruise the Spree River, which winds through the city. Art and Music: Explore the Old Masters collection of the Gemäldegalerie, the jewel of the Kulturforum museum complex. Tour the imposing Pergamon Museum, showcasing magnificent collections of Greek, Roman, and Islamic treasures, then visit other museums of your choice with your full-day museum pass. Go behind the scenes at the Berliner Philharmonie, home to the Berlin Philharmonic Orchestra, during a tour of the landmark concert hall. Later, take in evening concerts. Local Insight: Join discussions with local experts about wartime Berlin and the Cold War, and learn about the city’s musical legacy. Potsdam: Travel to nearby Potsdam, a royal seat of Prussia during the 17th century. Tour the Rococo palace of Sanssouci, the summer residence of Frederick the Great, and Schloss Cecilienhof, site of the decisive Potsdam Conference at the end of World War II. Depart the U.S. on an overnight trans-Atlantic flight to Berlin, Germany. Arrive at Berlin’s Tegel Airport and transfer to the upscale Hilton Berlin close to the city’s historic quarter and situated on the famous Gendarmenmarkt. 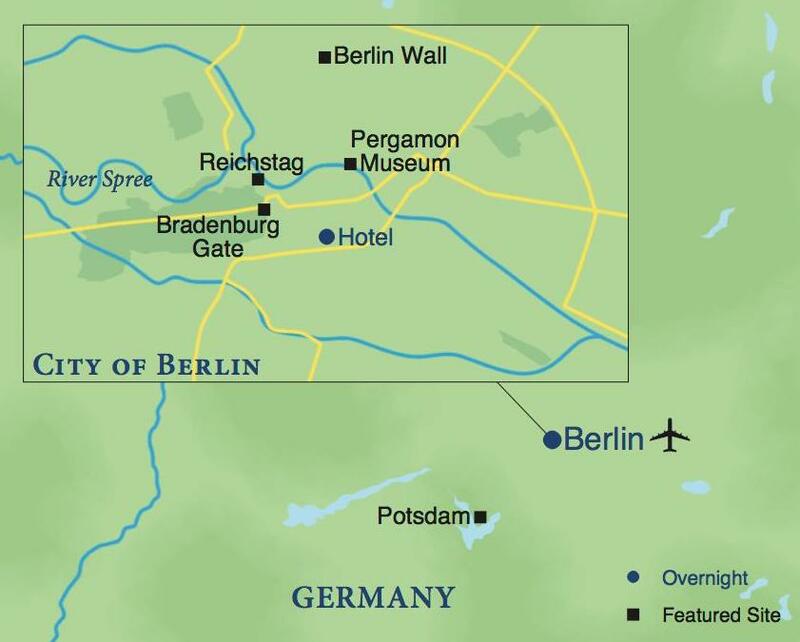 Upon arrival at the hotel, you’ll receive a Welcome Kit with maps and general information about Berlin and its environs. 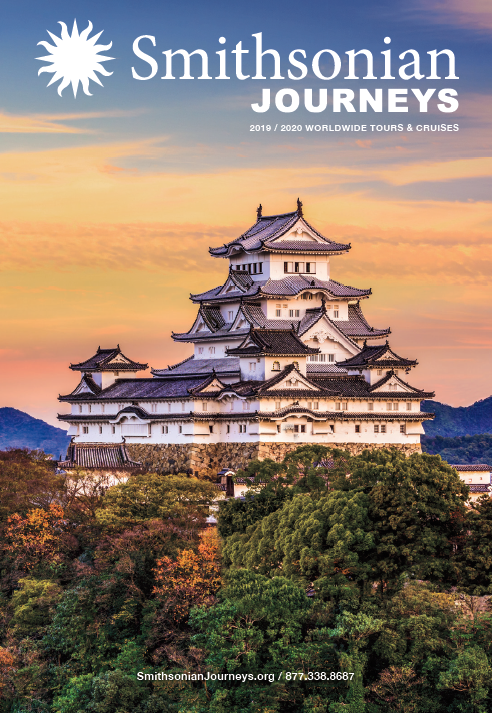 Your Smithsonian Journeys Travel Director will be available this afternoon and throughout the program for suggestions regarding sightseeing, restaurants and independent activities. A full American-style buffet breakfast is served at the hotel each morning during your stay. Educational Focus: Gather for a presentation: A Tale of Two Cities: East Berlin and West Berlin. Learn about Berlin’s Cold War past as a city divided into East and West sectors from a local expert. Excursion: Set-out on a panoramic motor coach tour of Berlin that includes the iconic Brandenburg Gate, Pariser Platz, the Federal Chancellery, Unter den Linden, a lovely tree-lined boulevard, the Gendarmenmarkt and a drive along the fashionable Kurfurstendamm. Visit the Bernauerstrasse Wall Memorial to see the last remnant of the infamous Berlin Wall with the preserved grounds, barbed wire, and guard tower, it provides a moving impression of how the wall divided the Eastern and Western sectors of this great city until late 1989. Excursion: Today, depart for the Reichstag, constructed in 1894 to house the Imperial Diet of the German Empire. Take a fascinating tour with an expert guide that includes the rooftop terrace for panoramic views of Berlin. Then board a canal boat for a cruise on the River Spree through the heart of the city. Lunch will be served at a lively beer garden in the famous Tiergarten. Excursion: Depart Berlin on a full-day excursion to historic Potsdam, known for its beautiful landscape of palaces and gardens. Discover Sanssouci, the former summer residence of Frederick the Great, King of Prussia. Admire the rococo architecture, extravagant furnishings, and manicured gardens. See the Neues Palais, a magnificent baroque castle. Then visit Cecilienhof Palace, a Tudor-style palace built in the early 20th century. Truman, Churchill, and Stalin gathered at this beautiful country house in 1945 to discuss the future of post-war Europe. Enjoy lunch at a restaurant in Potsdam. Independent Exploration: Spend some free time in Potsdam’s Dutch Quarter, an ensemble of 18th-century houses and buildings designed to bring a touch of the Netherlands to the city. Educational Focus: Gather for a presentation by a local expert: From Bach to Beethoven: Music That Stirs the Heart. Excursion: Depart the hotel for a behind-the-scenes visit to the Konzerthaus, home to the Berlin Philharmonic. Later, visit the Gemaldegalerie for an escorted tour of one of the world’s finest collections of European art. This afternoon, let your interests be your guide and explore the city on your own. Excursion: Visit Schoeneberg Town Hall and view the famous balcony where President John F. Kennedy made his famous 1963 speech, proclaiming “Ich bin ein Berliner.” Also, see the poignant exhibit Wir waren Nachbarn that documents the lives of Jewish residents who lived in this neighborhood, were deported or lost their lives during the Holocaust. Continue on to the Stolpersteine, an artist’s memorial to Berlin’s Jews as well as the memorial site of the former Synagogue in the area. Join a local expert for a presentation: Time Witness of WWII and Cold War Berlin. Excursion: This morning, depart the hotel for a short walk to the Pergamon Museum for a guided tour of museum highlights. Each participant will receive a Museum Island Pass that includes entrance to all five museums in the complex.